Our summers aren't like they used to be. Now, our summers consist of working the same 9 to 5, dragging days in the stuffy classroom, or arduous days at that internship. No longer are the carefree days of our youth, when our biggest concerns were the girl next door, what time the pool closes, or tomorrow’s ball game. Next time you're going through a rough patch, simply mist Fresh Cut Grass Air Freshener and Odor Eliminator to remind yourself of happier summer times and reinvigorate your spirit with concentrated motivation! 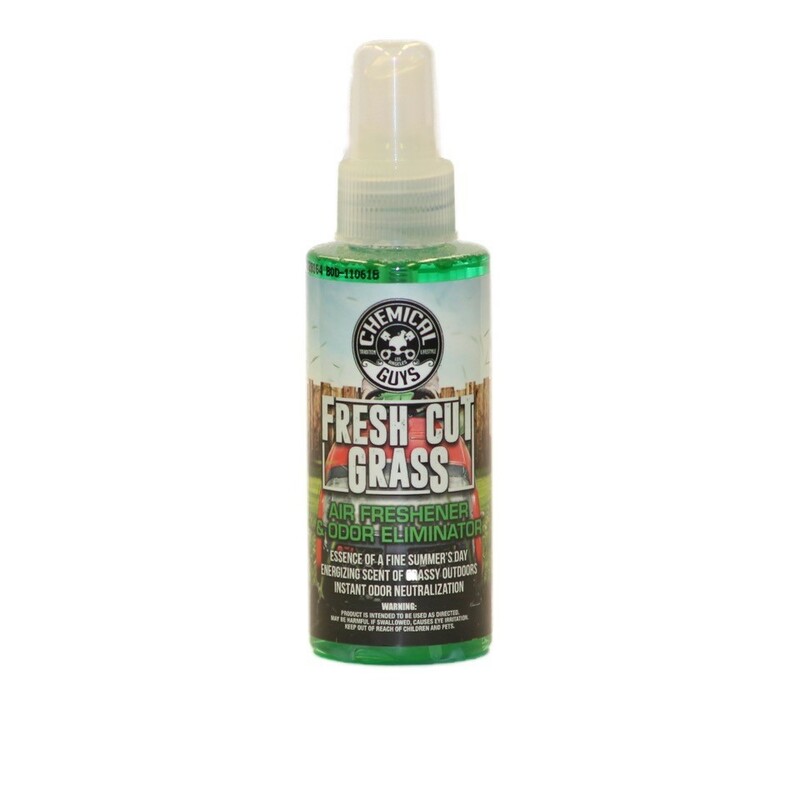 Fresh Cut Grass isn't just an air freshener- it’s also a powerful odor eliminator that targets and then destroys foul odors at their source for the freshest experience possible. With just a few sprays, this premium air freshener brings distilled youth to your home, office, workspace, or vehicle for ultimate summer inspiration, without the perspiration. Is it possible to distill an entire season in a bottle? Well, Chemical Guys has done it with the all-new Fresh Cut Grass Air Freshener and Odor Eliminator! Squeeze the trigger, sit back, feel the soft grass sprout from under you, and take in the scent of carefree childhood summers. This grassy outdoors aroma brings back memories of those long sunny days lounging on a recently cut lawn with friends, playing sports on that newly trimmed and marked turf, or waking up late on a lazy summer morning to the beating sound of a lawnmower in the distance and the sweet smell of just mowed grass wafting in through your window. The equivalent of acres and acres of freshly mowed meadows in a bottle, this premium air freshener is sure to get your memory receptors working overtime to release all the dopamine associated with your pleasurable youth when you need it the most- without ever pulling the mower out of the shed. Escape to a warm summer’s day any month of the year with Chemical Guys Fresh Cut Grass Air Freshener and Odor Eliminator!